We are still in the midst of wedding season, and as we always say: "Cookbooks make the perfect gift". In case you need some inspiration, here is a curated selection of great gift books, in keeping with the popular wedding rhyme that often influences the bride's attire: "Something Old, Something New, Something Borrowed, Something Blue." Each book is linked to a listing on our website where you may purchase the book online to be collected in store, or shipped. This lovely book is in keeping with the Chez Panisse philosophy of serving the freshest foods prepared simply and stylishly. Arranged alphabetically by vegetable, and filled with colourful linocut images, this book makes it easy to find a tempting recipe for market produce. 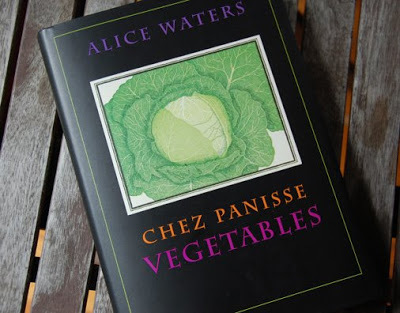 If this book isn't old enough for you (it was published in 1996) we also have a selection of beautifully illustrated and hand-lettered Chez Panisse recipes suitable for framing available in our shop. These recipes were originally printed in 1970 and would be a beautiful piece of art for the kitchen. Please call, email or visit our shop for more information on these. Diana Henry is one of our favourite food writers. This book is brand new, and features the kind of things Diana likes best, food inspired by various cultures around the world, including the Middle East, Far East, and Scandanavia. The best part? She focuses this book on health conscious cooking: less meat, and more vegetables, grains and fish dishes. Many books "borrow" influence from others, whether they be other cultures or other cooks/authors. The SOBO Cookbook is one of these, and a special one indeed from the beloved SOBO restaurant in Tofino, British Columbia. Chef Lisa Ahier draws on her Texan background to create uniquely delicious dishes from local ingredients (ie: her Smoked Salmon Chowder made from local fish paired with chipotle chillies in adobo sauce.) This book also features beautiful photography of Tofino. I'm sure you can tell why this book fits the "Something Blue" title. This book is from the Sydney restaurant, Porteno and draws inspiration from the kitchens of Argentina with super-slow-cooked meats and seafood, alongside fresh and inventive vegetable dishes and luscious cocktails. Give the gift of transportation to another place via a book with this beautifully written and photographed cookbook. Perfect for adventurous, experienced cooks.